Madison is responsible for many wonderful projects that seem to spring like colorful mushrooms after an acidic rain. 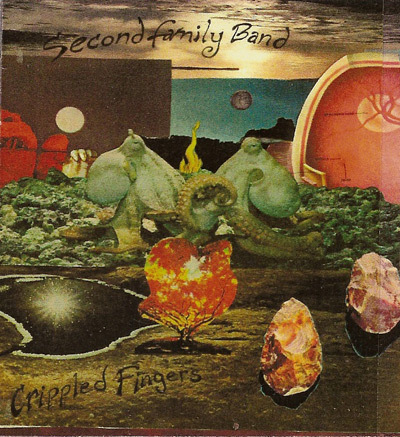 It seems like throughout the years of its existence, the Second Family Band had served as a family for numerous musicians from madison, with no apparent constant member to it, but with an everlasting arsenal of new names. On “Crippled Fingers” we meet the names Ian Adcock, Moodle Blood and Troy Schafer, so let us assume that these are the guys we are listening to. “Crippled Fingers” is one track that is 15 minutes long, pressed on a nicely covered 3″ CDr. The painting/collage that serves as cover art smells like a joyous psychedelic candy, and if this is a promise, then this incarnation of Second Family Band keeps it with the music. Crippled Fingers begin with a rolling blend of obscure string playing and percussion, and over the hiss of a recording tape, different experiments will be heard, each producing a different abstract, yet somehow rhythmic vibe. Gently flowing between a Nurse With Wounds-like distant bell ringing, to warm sounds of an open field guitar playing, Crippled Fingers is a small but eventful promise and an enlightening experience. This is yet another fine example of the good music of Madison. Check it!